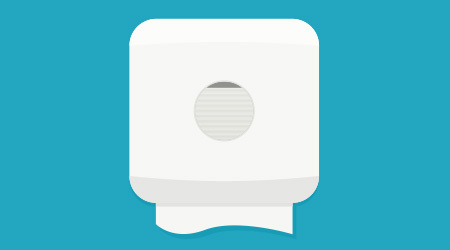 The third part of this three-part article highlights the rise of jet-air hand dryers. Today, more facilities are installing jet-air hand dryers that rely on high-velocity air rather than just heat to speed up the drying process. Jet-air hand dryers can dry hands in approximately 10 to 15 seconds — about half the time it takes to dry hands with a heated-air hand dryer. Although most jet-air dryers use unheated air, some models offer heated air as a comfort consideration. However, NSF International, formerly the National Sanitation Foundation, Ann Arbor, Michigan, recommends that facilities install dryers without heating elements, because heat strips essential oils from the skin, which can create micro tears and cracks in the skin that harbor infection. Granite Telecommunications in Boston switched from heated jet-air hand dryers to non-heated jet-air hand dryers, because employees were complaining that the heated air dried out their skin. To date, Granite Telecommunications has replaced approximately 20 heated dryers with non-heated units in its restrooms and is still in the process of converting the remainder. Meegan says the velocity of the air in the new dryers is so fast that it feels as if it’s heated. Dowling of SupplyWorks, Meegan’s distributor, admits that traditional heated-air hand dryers are less common today, due to the advent of jet-air dryers. Regardless of whether customers opt for heated, non-heated or jet-air hand dryers, end users sometimes grow impatient with the length of time it takes to dry their hands and therefore don’t dry their hands completely, or they wipe them on their clothing as they exit the restroom. Neither option is sanitary. Facilities managers should, therefore, opt for whatever type of hand dryer — heated, non-heated, jet air — that patrons in that facility most prefer, since a hand dryer only aids in hand hygiene if it is used and used correctly. As a result, distributors will need to carry a few different models to guarantee the sale. Kassandra Kania is a freelance writer based in Charlotte, North Carolina. She is a frequent contributor to Sanitary Maintenance.